Never let them forget a number and they'll never forget your brand! Our pocket-sized spiral-bound mini business card holder and jotter features a clear business card pocket on the bold translucent color cover, plus 40 lined sheets of note paper. Imprint options are deboss, hot foil stamping and silkscreen. It's a perfect promo piece for lots of businesses. Carry it around, keep your logo visible, and hand it out at your next trade show! Give your brand the best kind of corporate exposure this season! 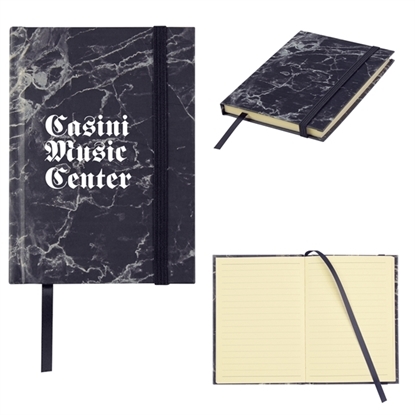 This spiral-bound Color Wave Notebook features white PP cover with contrasting bold color large front pocket with die-cut detail. Matching ballpoint pen included. Perfect for banks, financial services, insurance companies, hotels and more. Have your logo silkscreened on this classy envelope in two generous imprint sizes and your business will always be presented in the best light! 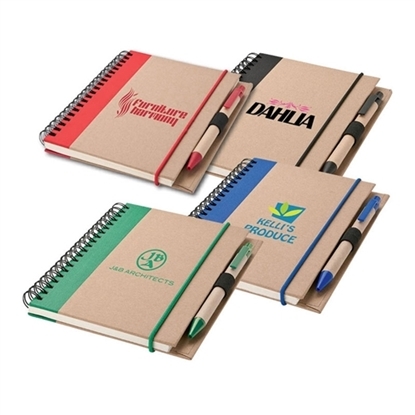 Neither too big nor too small, this notebook fits your logo like a glove! 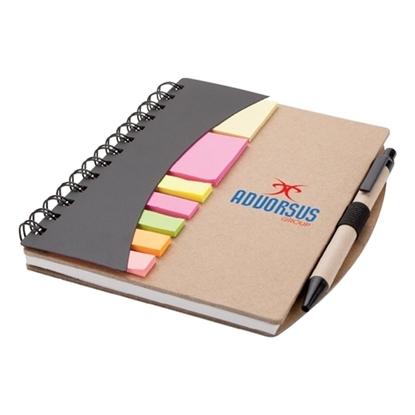 Our Mini Pocket Buddy Notebook features a bright translucent color cover, 50 lined spiral-bound pages, and separate zip-lock plastic pocket attached to the spine. 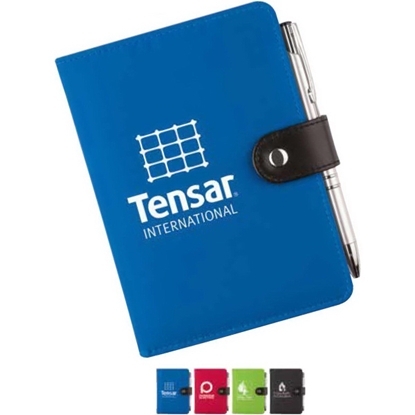 Measuring 5 1/2" x 4 1/4" x 1/2", it's an ideal size to carry around and still have comfortable space to write! Get a silkscreened imprint of your company's logo and your business will always be exposed. Here's one promo that should become a staple in your trade show bag! 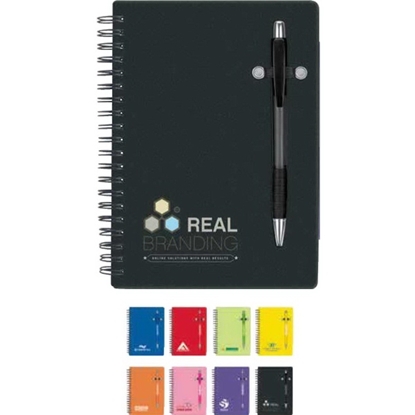 Our All-in-One Mini Notebook features a bright translucent color cover, matching translucent ballpoint pen (white comes with a black pen), and built-in ruler on the cover. 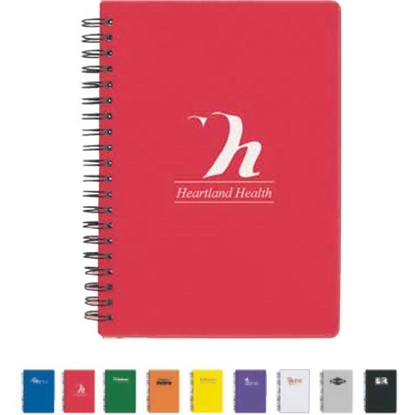 This 5 1/8" H x 4 1/8" W x 1/2" notebook is spiral-bound with 50 lined pages and includes color-coded self-stick tabs and memo pad. Great for your briefcase. Perfect for businesses and nonprofits of all kinds. It's attractive, easy to carry around and comfortable to write in! 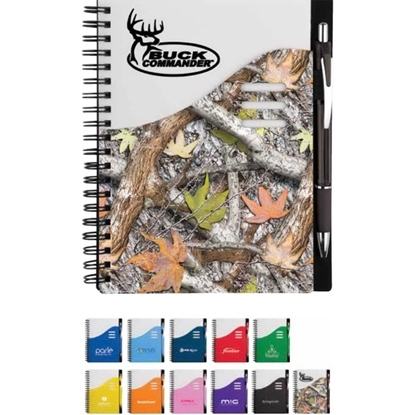 Our translucent notebook has a bright translucent color cover, available in your choice of a variety of colors, and is spiral bound with 80 lined pages. Measuring 7" H x 5 1/2" W x 3/4", it's a perfect promo piece for banks, financial services, insurance companies, hotels and more. Have your logo silkscreened and your business will always be presented in the best light! Spiral bound 70-page lined notebook with solid textured PP cover. Includes translucent colored zip-close bag, perfect for storing receipts or cards! 80 Page Lined Notebook. Matching Bookmark And Strap Closure. Polyurethane Cover. 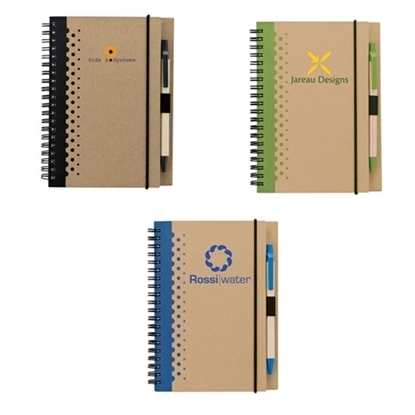 Keep a record of your marketing campaign with this Pen-Buddy Notebook! Our spiral-bound book features a bright translucent color cover, matching color translucent ballpoint pen, and 70 lined pages. Measuring 7" H x 5 1/2" W x 1/4", it's a perfect promotional piece for banks, financial services, insurance companies, hotels and more! Have your logo silkscreened on the cover and your business will always be presented in the best light! 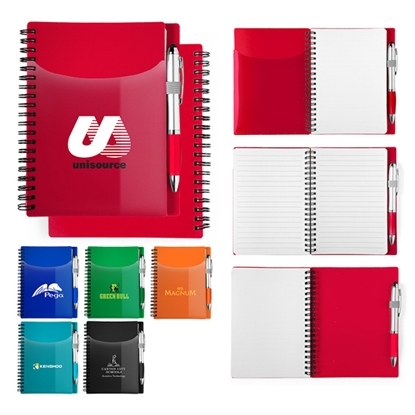 Clear translucent cover accented with bold color sound wave graphics, Matching\ncolor liner page, Spiral bound with 80 lined pages, Separate clear ziplock plastic pocket\nattached to the spine. Features: Junior-Size Notebook. Recycled Paper Cover. 70 Lined Recycled Pages. Plunge-Action Ballpoint Pen with Recycled Paper Barrel. Spiral Binding. Elastic Closure. 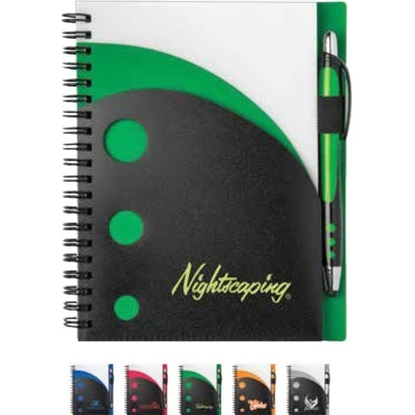 Spiral bound 70-page lined notebook with bold color PP cover and translucent pocket. Elastic pen strap, includes color coordinating Translucent Curvaceous Ballpoint (PB1572) with black ink. 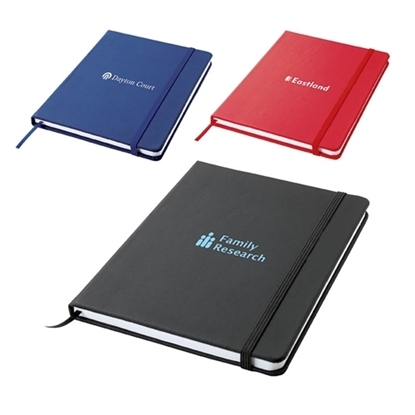 Show your customers how to create their own book with our Large Divide Notebook! 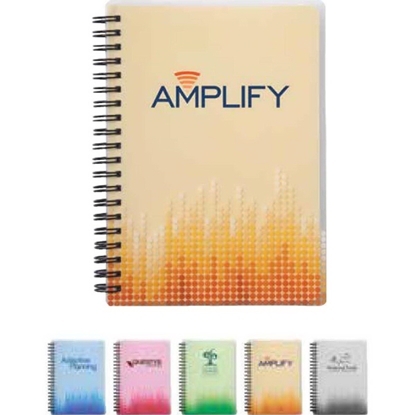 This 7" H x 5" W x 1/2" spiral-bound packet features bold colors with white cover, 4 matching color adjustable tab separators (you place), 80 lined sheets, and matching elastic band closure. This clinical-looking booklet fits right in with doctor's offices, medical centers, hospitals and laboratories. Your logo is silkscreened on the large imprint area for success! 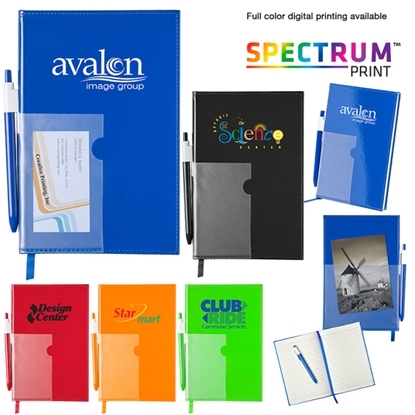 Write your marketing campaign in translucent colors with this New Wave Pocket Buddy Notebook! 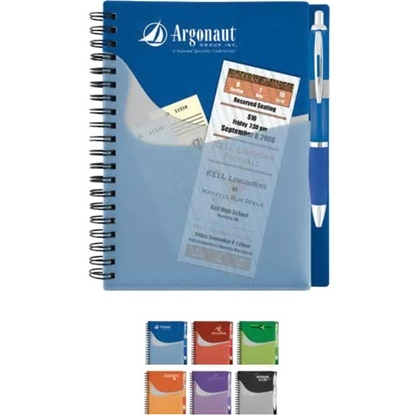 Spiral bound, it has brilliant translucent color covers with matching translucent ballpoint pen, convenient extra note pocket on the outside cover and an inside pocket to hold business cards or notes, and 70 lined pages. 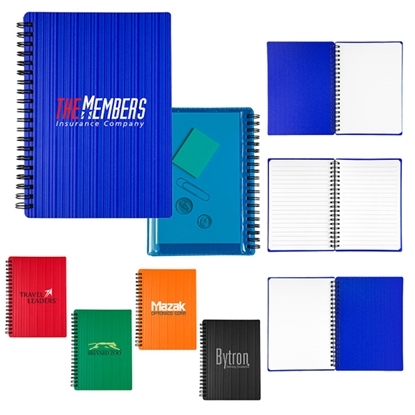 Ideal for any organization that wants to stand out. Have your logo silkscreened on this 7 1/8" H x 6" W x 3/4" book today! Features: Junior-Size Notebook. Recycled Cover Boards. Hard Polypropylene Flag Cover. 70 Lined Recycled Pages. Plunge-Action Ballpoint Pen with Recycled Paper Barrel. Spiral Binding. Chrome or Black Trim. Features: Junior-Size Notebook. 80 Lined Recycled Pages. Plunge-Action Ballpoint Pen with Recycled Paper Barrel. Spiral Binding. Elastic Closure. Pen Loop. Spiral bound 70-page lined notebook with white cover and two contrasting cover pockets with die cut detailing. Elastic pen strap, includes color coordinating Illusion Stylus Gel Pen (GP3799) with blue gel ink and capacitive stylus tip. 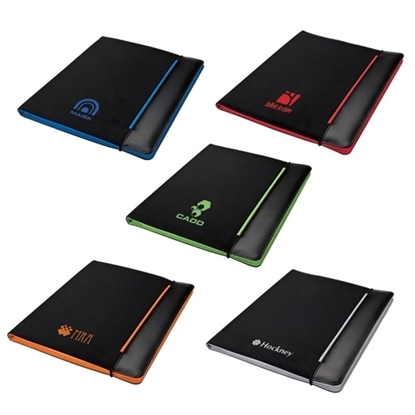 Perfect bound 80-page lined notebook with glossy PVC laminated cover and translucent cover pocket. Includes matching ribbon bookmark and ballpoint pen that attaches to cover.\n\nCustom insert available, call factory for details. Color your promotional world with success this season! 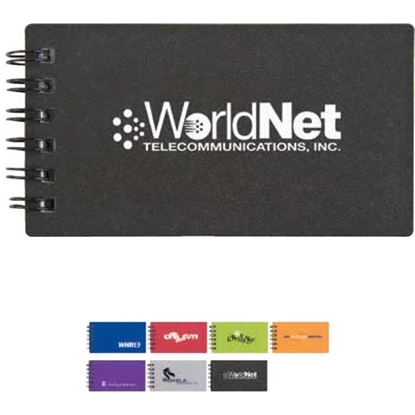 Our Color My World Snap Notebook features a microfiber cover with contrasting black leatherette snap closure, 40 pages of lined stone paper, metallic slim ballpoint pen, which fits securely in a pen loop hidden in the snap closure. Slim and compact, it's perfect for travel or elegant enough for any desk. It's ideal for technology firms, banks, resorts and more. Greet your customers in style! 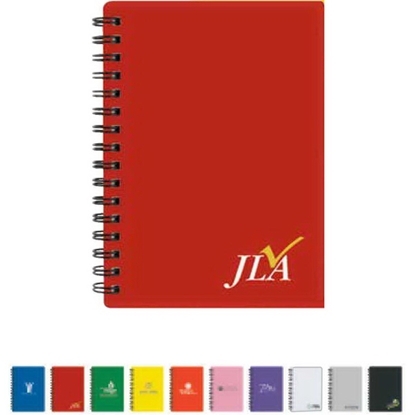 Add a decidedly upscale look to your promotional items with this All Together Metallic Color Journal Notebook! Features include rich metallic color cover, 140 white die-cut gray lined pages, and contrasting black elastic band closure. 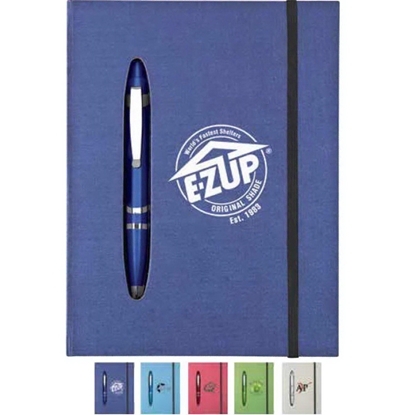 The matching metallic color plastic ballpoint pen fits into the book and stays put when closed. Measuring 7 3/8" H x 5 1/2" W x 3/4", it's a perfect trade show handout to showcase almost any business! 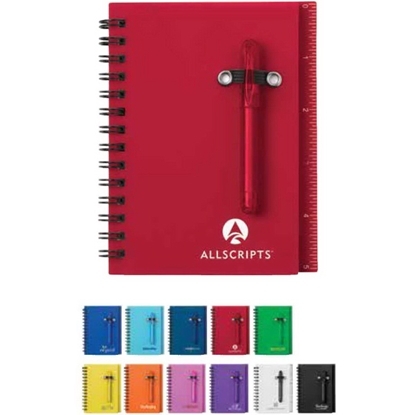 Features: Letter size folio with replaceable 40-page Sovrano writing pad, 3 pen loops, 2 card slots, file pocket and colorful elastic closure with matching color interior. 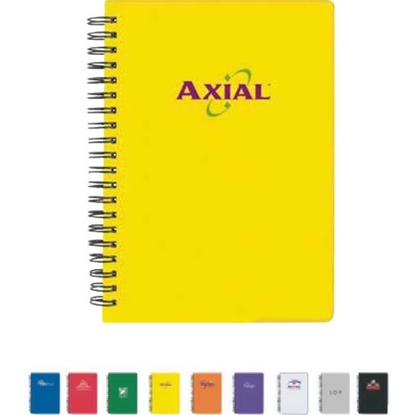 Mypromotionalpens.com offers the largest and best priced selection in Promotional Notebooks & Padfolios. We will price compete and we won't be under sold. Let our graphic designers make your personalized Notebooks & Padfolios standout above the crowd at no charge. We won't stop until you are completely satisfied with your custom Notebooks & Padfolios art proof.Use category search filters on your left to help narrow your search to find exactly what you are looking for.